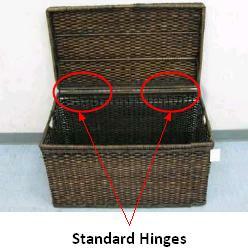 Target has recalled 14 different models of woven storage trunks due to a dangerous strangulation hazard. The lid of the trunk can suddenly drop, causing a strangulation hazard to small children who are opening or reaching into the trunks. If you happen to have one of these trunks, you should definitely stop using it immediately and move it where children cannot have access to it. Approximately 350,000 trunks which were manufactured in China and the Philippines are being recalled. The trunks are brown or natural in color, and approximately 3′ x 1′ x 1′. 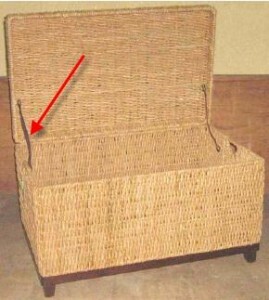 They are made of woven rattan, banana leaf or abaca and feature standard hinges. The trunks were sold at Target stores nationwide and online from February 2009 to April 2010 at a cost of between $50 and $130. Below are pictures of some of the trunks. For additional photos of other models, visit Target’s website. The U.S. Consumer Product Safety Commission has already received two reports of injuries that came about when the storage trunks’ lids suddenly closed on children. One tragic incident involved an 18-month-old girl who reportedly suffered debilitating brain damage when the trunk’s lid fell on the back of her neck and pinned her throat against the trunk’s rim. Consumers should return the storage trunks to any Target store for a refund or replacement or call Target at (800) 440-0680 between 7 a.m. and 6 p.m. CT Monday through Friday, or visit their website. If you or a loved one has been injured by a defective or recalled product, contact the Oklahoma lawyers at Carr & Carr.